I love that zucchini and yellow squash are inexpensive over the Summer. I inevitably pick some up at the grocery store every week. 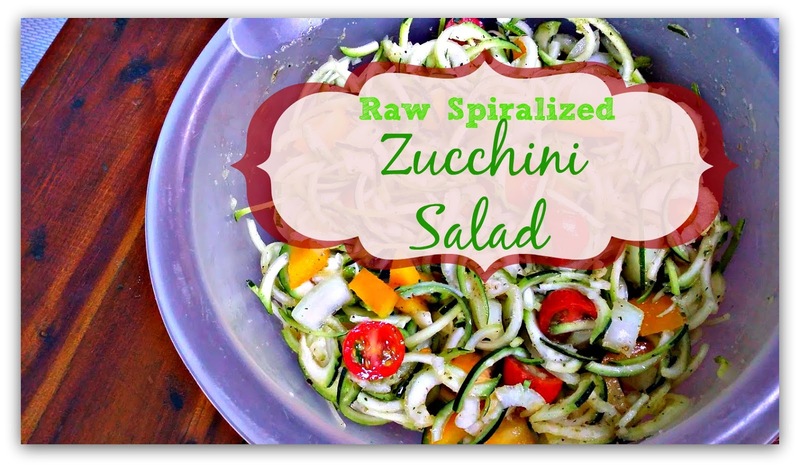 This week I decided to bust out my trusty spiralizer and make a raw spiralized zucchini salad to take with us on our camping trip this weekend. This salad is pretty simple, with just a few ingredients. 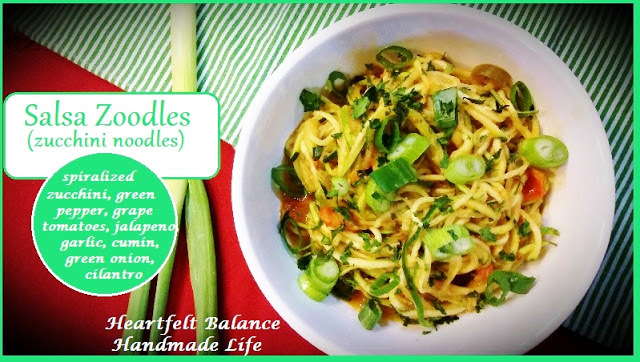 You could of course add as many ingredients as you like and switch this up to your taste. I basically made it the same way I would a traditional pasta salad. I added some tomatoes, onions and peppers and an "Italian" dressing. 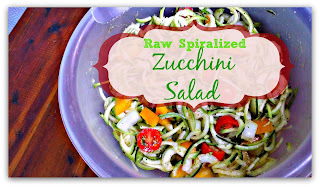 This zucchini salad used about 1 1/2 spiralized zucchinis. 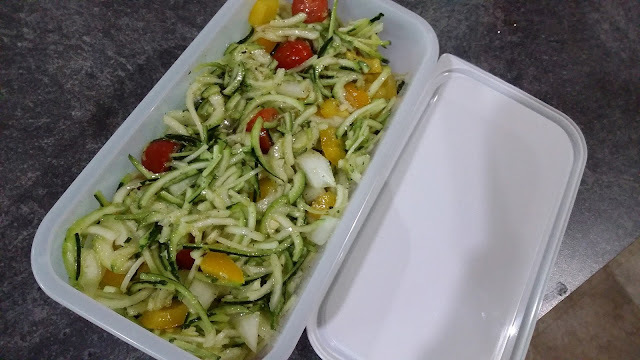 I spiralized 3 zucchini the other day when I was in my kitchen trying to get some of my veggies "processed" and the three of them filled 2 of the regular sized rectangular "disposable" containers. (Think the size that some lunch meats come in.) 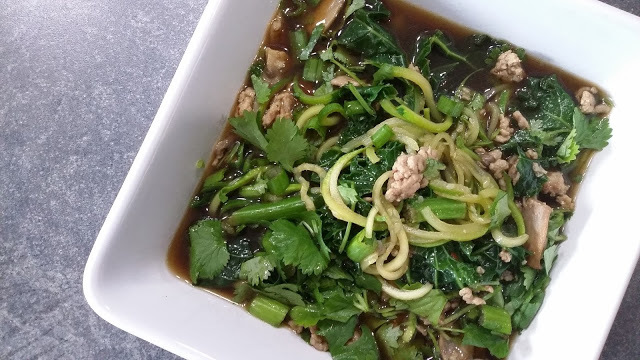 We used 1 container full of the zucchini noodles for this~~more than shown in this container. That container was FULL!!! 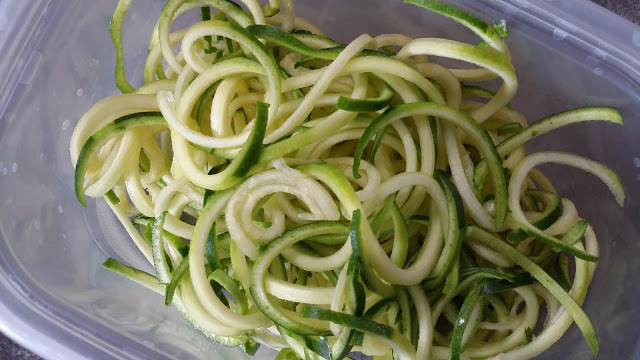 I decided that my zucchini spirals were probably too long to be able to eat easily in a zoodle salad, so I cut them with a pair of kitchen shears by cutting down into the bowl of zoodles. Combine all of the veggies. Mix together the olive oil, vinegar, Italian seasonings, garlic powder, onion powder and black pepper. Pour dressing over veggies and toss until all veggies are covered. It is ready to eat as is, or can be chilled in the fridge. I just put mine in our camping containers. My hubby wanted all square and rectangle containers for the coolers, so I found these freezer containers at aldi last week. We'll see how they work out. Not sure I'm too thrilled with them just yet. Hopefully they'll work for what we need them for. Have you ever made a spiralized zucchini salad before? and what do you put in yours if so? This post may contain affiliate links. If you shop through the links, I may make a small commission. This post might be linked to any one of the parties listed on my Link Parties and Communities Page Take a minute and follow on Facebook ??? Pretty, pretty please? With a cherry on top? Make sure you never miss a Mish-Mash post. Follow by RSS or Email HERE.